Countless, tiny and small Tenerife shops are, indeed, different and offer you a adventure for buying things. Look at unusual treasures like this funny species of several pumpkins seen at Tienda Carmen in Los Realejos Toscal, Longuera, C/Longuera, 13. All big retail outlets in Tenerife resemble, usually, those found in northern Europe and in the United States. Therefore, let's look at two typical small Spanish versions today. Also, just now, you will be able to read up on fundamental differences caused by Spanish customer service in big or small shops. I once had a friend who was allergic. She bought Dinkle Bread/(Spelt bread) and organically grown lattice at a health shop (Tienda de salúd) on Plaza del Charco in Puerto de la Cruz. Spelt bread is also sold at one of my local bakeries in Toscal of Realejos. You pay from Euro 0,70 to Euro 2,50. The latter is a square loaf. Health shops in Tenerife are well stocked with much variety. They cover a niche with good demand but, are more expensive. They are everywhere on the island. However, you might locate Tenerife organic produce of Spain at small Tenerife so called Tiendas at lower prices, as well. Yes, it closed for retirement in 2014. It wasn't just a resource for organic produce and imported condiments from all over the world. Many expats and natives preferred to shop there. A British friend said the other day that we love those tiny shops. They are so much more fun. Strange people suddenly may talk to you, unlike in big supermarkets. Even the owner and employees have more time for you. How do you know when produce and fruit come from local farmers and might even be organically grown and without pesticides? A cabbage or carrot with imperfections and the odd snail-bite mark has not seen artificial fertilizers and other chemicals and comes from a Tenerife farm. Tiny dark red regular tomatoes or any other fruit of inferior size wouldn't pass the grade in big Tenerife retail outlets either. 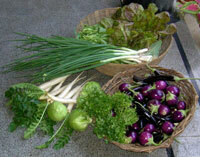 Note the exception for small produce in Tenerife is the Papa Bonita. The Papa Bonita is the most tasty potato which is cultivated in Tenerife. It's yellow inside and costs sometimes more than Euro 6 per kg. I have seen Papas Bonitas on sale in a small shop behind Iglesia Peña de Francia of Puerto Cruz, a long time ago. This Andean papa which once came from Peru, hardly ever makes it into Tenerife shops. Unless, their owners buy the Bonitas for themselves or barter them for other articles, such as good local wines, Tenerife goat cheese and the like. News 2013 Papas Yema huevo for Euro 4 I spotted them as tiny Papas Bonitas Negras in the same shop, on July 23, in the same shop which is next door to Café Ebano Calle La Hoya. An absolute give away for that price. By the way,Yema de huevo means egg yolk and is an extremely tasty potato, but isn't suited for salads and French Fries. By the way, this shop also sold lose Tamarind spice pieces which looked like a rolled up black piece of bark from the outside. This is another of surprising Tenerife shops. Why? It has no name displayed, but sells rare produce and herbs. Find it next door to the well known Café Ebano behind the biggest church in Puerto de la Cruz, by Calle La Hoya. You only encounter imperfect produce and fruit at small shops like Carmen's. 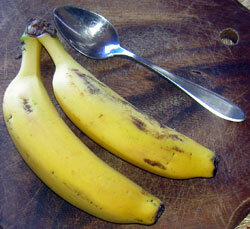 Tiny local Tenerife bananas as seen here next to a tea spoon, are considered inferior but, have more nutritional value. The proof by banana analysis has been established. In fact, such fruit doesn't only taste better but, also has more proteins. Buy it cheap for less than €1.00 a kg at small shops. The Longuera Agricultor farmer shop sold them for 0,65 in 2019. Charcuteria Peñon near the Peñon and Soccer Stadium in C/Mequinez in Puerto de la Cruz is even cheaper. Both shops beat municipal market prices with their bananas, as their fruit isn't grown in expensive shade houses. Find out how small Tenerife shops often sell more and different products than those which are taken for granted at the big Puerto Cruz Sumo Spar store. Here i must add, that much window advertisement is taking place there, off lately in 2013. Discover in details what the popular Saroj Supermarket of Tenerife has. It stocks African, Libanese, Turkish, local and other Oriental foods, just like Fruteria M Carmen, but he sells more frozen or dried Asian convenience food besides Ayurvedic, Vegetarian and some Vegan products as well as some Hindu surprises. Besides, small Tenerife shops may look like merchandise crowded oriental Bazars, where it's often hard to see unusual things on first sight. Unfortunately, the enticing tea and herb shop at Martianez shopping mall disappeared in 2013.. Perhaps, its products are sold on Plaza de Europa, as somebody said. However, stalls are only allowed to operate there on special public holidays now, contrary to all Sundays as before. or get them in the BIO-store in Calle Hoya in Puerto de la Cruz or at Agrokinesis in La Longuera of Realejos. Let me whisper a secret for British folks on holiday in Tenerife. Las Cuevas/La Orotava which discover just before the Humboldt look-out. You can also buy a slice of this delicious meat loaf ready made at his outlet in the Canary Center in La Paz Puerto de la Cruz. Find its Delicatessen almost opposite Hotel Botanico. People with a holiday home in Tenerife appreciate retail outlets for shopping Puerto Cruz with photos, addresses and detailed information. Are some Tenerife shops cheaper? Absolutely, some of them are cheaper than others. But, you should see how crowded Tienda Carmen was on a Saturday morning, when her customers came from far. Don't forget, IGIC or 'General sales tax' in Tenerife is much lower like everywhere in Canarias compared to mainland Spain. However, you can't just say 6,5% (7% before in 2018) in Tenerife contrary to 21% IVA on mainland Spain. Some things on the Canary Islands also are higher taxed. Nevertheless, IVA makes a big difference when you buy a new holiday home. How much and why more than sales tax is relevant when you compare Tenerife with the main land.